At this point I really do think I'm becoming something of a scented candle connoisseur. I have definitive opinions on what I like and what I don't, what makes a candle worthy of a purchase and what doesn't, suffice to say not every scented candle I try makes it onto these pages. This could be because they simply don't scent a room how I'd expect them to, or they might smell cheap and give me a headache or perhaps they'd be perfectly fine for the first few days and then they splutter and burn unevenly. This is especially frustrating when it's a candle I do like and I find it can be a common issue with some double wicked brands. 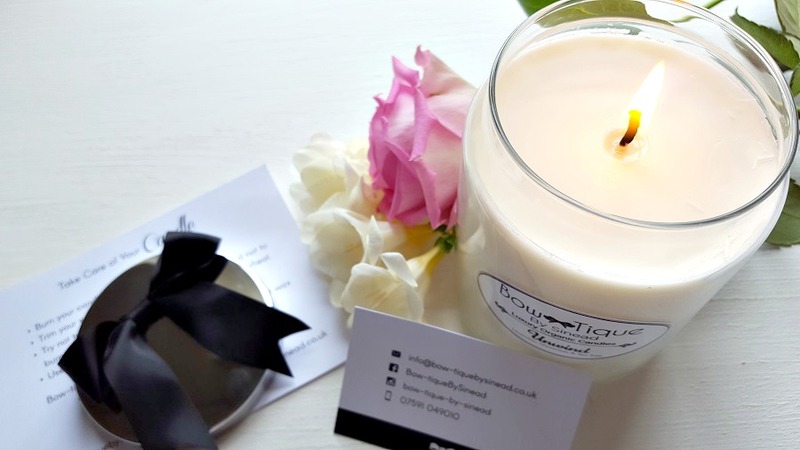 However, none of these issues popped up during my time reviewing today's luxury scented candle and I have to admit I've fallen so hard for this brand, Bow-tique By Sinead, and it's safe to say I'm already considering what scent I'll opt for next. I had been following and chatting with Sinead for a while before she took the leap and launched her luxury candle range and so when she popped one in the post for me I was hesitant, as I always am when it's a local business - I have an inherent want for their products to be amazing so that I can sing it from the rooftops. Well, consider this post as me singing from the rooftops because I am absolutely 100% blown away by this candle. Firstly, the Bow-tique packaging is sleek, simple and effective. The candles are a fantastic size (800g) and boast a burn time of 90-110 hours. Personally, I've burned this every night since I received it almost two weeks ago and I've barely made a dent in it. 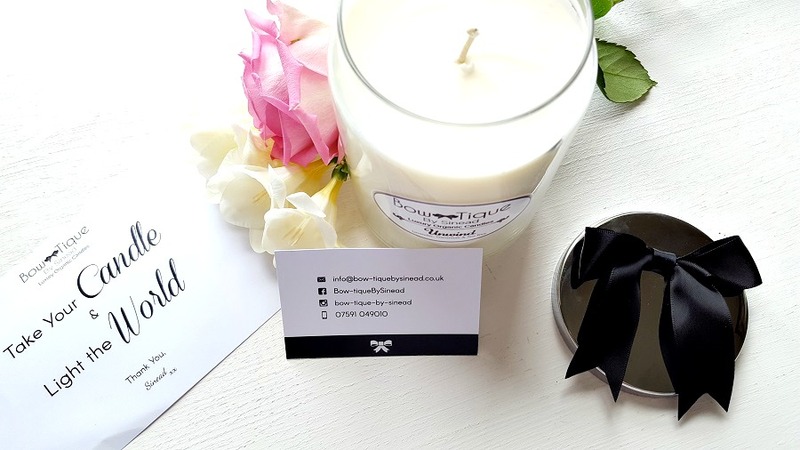 Not only that but thanks to the handy candle burning tips card that Sinead included with the candle, I've been using it with care, ensuring the wick is trimmed before relighting and so it has burned very smoothly during that time with a pretty impressive flame and no spluttering. The addition of the bow in the details and on the lid is incredibly pretty, feminine but not ridiculously so. Down to the nitty gritty, the scent. I, very gratefully, received the Unwind* scent which is comprised of Lavender, Geranium and Tea Tree. On first sniff I was hesitant. It did smell strong and I admit to having reservations as to how that would transfer during burning but I had no need to be concerned at all. You know those times when you find you adore a product so much you almost feel your words won't do it justice? That's where I am with this candle. It's the perfect luxury scented candle. I imagine this is a candle that all spas and retreats should burn in their relaxation areas. In fact, that's a marriage made in heaven and I'd wholly urge any salons or spas to get in touch with Sinead to see about making that a reality because I guarantee your customers would make enquiries about the candle. Sinead has managed the perfect blend between essential oils in a way that isn't at all overpowering and yet manages to scent a space beautifully. With some candle brands I do find that it doesn't take long for my head to start pounding because they've overdone the strength of the oils but this is wonderfully balanced. I was so taken with this particular candle that it actually inspired me to create a serenity corner or reading nook in my living room this past week. Yes, I redecorated off the back of a candle. In all seriousness it's the type of candle that does allow you to feel relaxed, as though you are nestled in a spa and I'd fully recommend them to anyone - in fact, I already have! The best point of note in regards to Bow-Tique By Sinead Luxury Scented Candles is that they are organic. The wax is all natural, perfect for burning if you have little ones or suffer with allergies or asthma. This is worth noting because I know a fair few friends now affected by a well-known candle brand and unfortunately can't burn them due to health reasons. I'm stuck between Calming or Uplifting for my next addition. It's a fantastic collection and I really do wish Sinead all the very best with it as I truly believe she has a wonderful product on her hands that I know I'd love to see burning in local salons and homes. My whole downstairs smells like a spa and I genuinely couldn't be more delighted with this find. 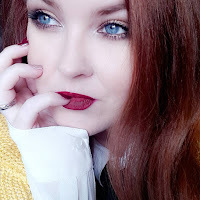 Please do support Bow-tique by Sinead by popping over to her Facebook and Instagram, I know she's planning lots of amazing giveaways and as the saying goes... you gotta be in it to win it! *This post contains reviews of some products sent for consideration. These are clearly marked with * I am not under any obligation (paid or otherwise) to give glowing reviews and will always ensure I give you my full and frank opinion in these cases.